An ancient ritual performed by a venerable and often stoned priestess, sybil or oracle, usually involving the entrails of a hapless deceased animal, to explain an unexpected event. E.g., the British Columbia provincial election of May 14, 2013. 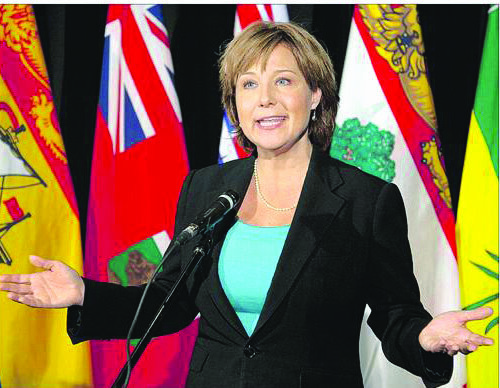 Pollsters, pundits and prophets unanimously predicted that NDP leader Adrian Dix would be elected the next premier of the resource-rich west coast Canadian province, unseating right-of-centre Liberal Party Premier Christy Clark. The pontificating classes had the NDP ahead by as much as 20 points going into the election, and leading by somewhere between 6 and 9 points right up to election day. Christy Clark, re-elected B.C. premier. Instead, Clark won a comfortable majority, taking 50 of 85 seats, pretty much the same result as in the 2009 and 2005 elections. Social Democrats, weeping into their beer and lattes, could take only minor comfort in the small glitch of Clark losing her Vancouver-Point Grey seat to NDP up-and-comer Dave Eby. The NDP again forms the official opposition, with 33 seats. The first elected Green Party MLA and one independent round out the legislative complement. Only about half the eligible voters cast a ballot (again, not much different from previous elections), prompting one wag to quip about the much-vaunted impact of social media on politics, “There were more Tweets than votes.” The Liberals won by a sizeable 5 percentage points, 44 per cent to 39 per cent, just the reverse of the way the pre-election pollsters called it. The pollsters spent the post-mortem dawn tweaking their algorithms. Meanwhile, the Oracle of Vancouver’s Downtown Eastside, emerging from a dark lane filled with discarded needles and condoms, explained it all, muttering, as did the winning and losing politicians, “The People, the People. The election belongs to the People.” Maybe the pundits, to echo a famous line by poet Bertolt Brecht, need to elect a new people.